Joint Preservation is a concept of restoring normal and pain-free function to the knee, hip, shoulder and ankle joints. It is achieved though the use of multi-modality treatment options that can include activity modification, physical therapy, medications, injections and surgery. Just as every patient is different, each patient's joint preservation strategy is personalized for his or her age, activity level, expectations and degree of joint dysfunction. Our surgeons are utilizing the most modern and innovative techniques in orthopedic surgery, including arthroscopy, non-operative modalities and rehabilitation. Our goal is to return patients to an active lifestyle by preserving the joint to ensure pain relief and return of function. We encourage patients to address their joint pain early and to avoid waiting until a replacement is the only option. 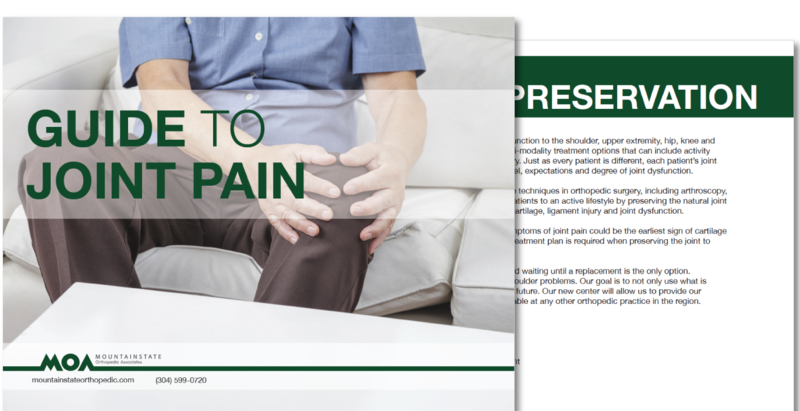 Many options are available to patients with hip, knee and shoulder problems. Our goal is not only use what is currently available but also to develop innovative solutions for the future. Our new center will allow us to provide joint preservation surgery with a level of expertise unavailable at any other orthopedic practice in the region. Learn more about the Center for Joint Preservation surgeons by visiting their doctor pages. Restore pain-free function to your joints!